The art of casting elaborate designs in gold had emerged in Panama by the middle of the first millennium A.D.; regional schools excelled in the techniques of cast and beaten gold. 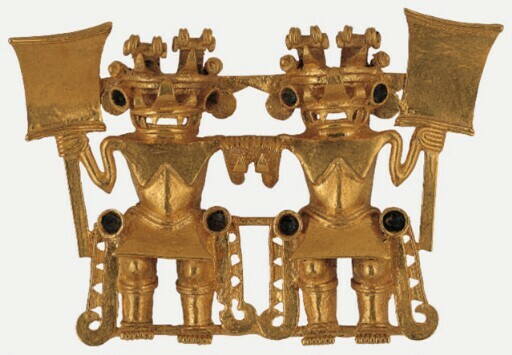 Gold became the primary prestige material in this region, and high-status individuals wore numerous ornaments in this material, which were later placed in quantity in their burials. The twin warriors motif depicted on this pendant is one of the most central to the Conte style, rendered here with exceptional technical and sculptural skill. A pair of standing bat-human figures hold paddle-shaped clubs in their outer hands. Each has a crested saurian head hanging from either side of its waistband. Their batlike heads are surmounted by what may be a pair of frontal birds, with simplified profile bird-heads at either side doubling as ear ornaments. These figures may represent warrior chiefs who were intermediaries between the earthly and cosmic realms.Pendants of this type probably functioned as emblems of status or as amulets. purchased by Kimbell Art Foundation, Fort Worth, 1979.